Dept of Cardiovasc & Thorac Surg, Clin Univ St Luc, Brussels, Belgium. Robotic lobectomy is the main thoracic procedure performed for oncological reasons, which has rapidly been evolving over this last decade, considering improved surgical techniques and enhanced technology systems. Operative indications are nowadays commonly extended for this technology considering the surgical technique, patient clinical stage and history. The procedure has rapidly been considered as effective as VATS and superior to thoracotomy, allowing significant reduction of the adverse per and postoperative events. It has recently been cited by large systematic reviews as superior to VATS. Oncological operative radically, that mainly considers the completeness of lymph node resection and the nodal upstaging, and the survival outcomes have been confirmed to be similar to those of the open and VATS procedures. Postoperative quality of life and pain management evaluations as well as pulmonary recovery testing have shown superiority to open techniques and equivalence to VATS. Debates are still active over costs, seeing intra and postoperative respective implications, with a net economic effect that seem positive over open techniques. All these topics will be argued in this special issue. 1.Robotic lobectomy for lung cancer: evolution in technique and technology. 2.Robotic sleeve lobectomy: technical details and early results. 3.Robotic lobectomies: when and why? 4.Robotic resection of Stage III lung cancer. 5.Robotic-Assisted, Video-Assisted Thoracoscopic and Open Lobectomy: Propensity-Matched Analysis of Recent Premier Data. 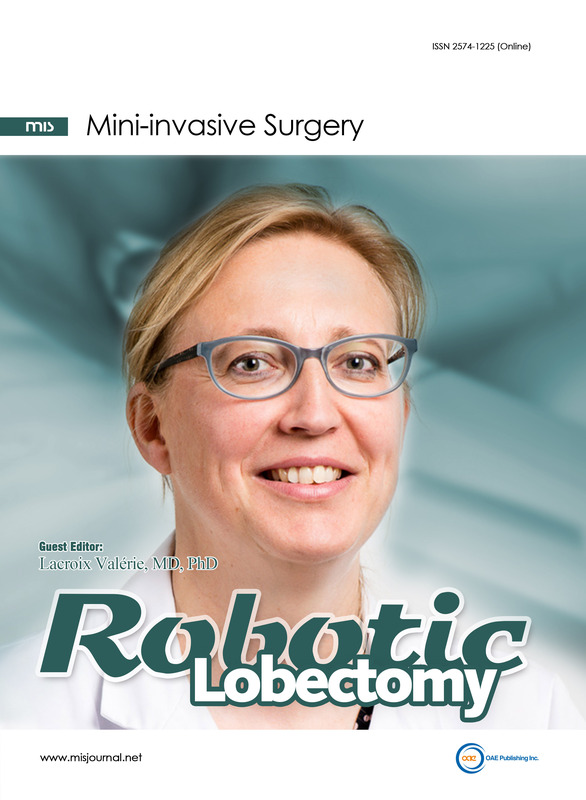 6.Robotic versus open and video-assisted thoracoscopic surgery approaches for lobectomy. 7.Long-term Survival Based on the Surgical Approach to Lobectomy for Clinical Stage I Non small Cell Lung Cancer: Comparison of Robotic, Video-assisted Thoracic Surgery, and Thoracotomy Lobectomy. 8.Nodal upstaging evaluation in NSCLC patients treated by robotic lobectomy. 9.Long-term survival of robotic lobectomy for non-small cell lung cancer. 10.Pain, Quality of Life, and Clinical Outcomes after Robotic Lobectomy. 11.The cost and quality of life outcomes in developing a robotic lobectomy program. 12.Hospital cost and clinical effectiveness of robotic-assisted versus video-assisted thoracoscopic and open lobectomy. 13.Robotic surgery, video-assisted thoracic surgery, and open surgery for early stage lung cancer: comparison of costs and outcomes.